Another fun-filled romp from Vicki Delany! 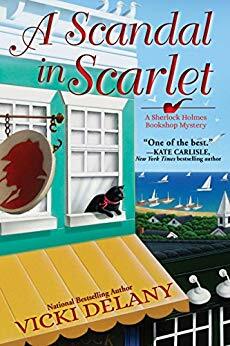 A Scandal in Scarlet is the fourth cozy in the Sherlock Holmes Bookshop mystery series. Gemma is walking her dog late one night when she sees flames behind the window of the historic Scarlet Museum. A candle left burning is ruled the cause of the fire. Due to interior damage, Kathy and the rest of the museum’s Board decide to have an auction to raise money for repairs. Jayne, co-owner with Gemma of Mrs. Hudson’s Tea Shop next door to Gemma’s bookshop, volunteers to hold the auction. Only one business refuses to donate an item for the auction, the uniformly disliked Maureen. When Maureen brings a truly hideous painting to donate the day of the auction, refuses to pay the entrance fee, and starts a loud fight with Kathy, Kathy’s day couldn’t get worse. But then she sees her recently ex-husband with his new older wife sitting in the back of the room. She goes into a backroom to recuperate after the two shocks. When she doesn’t come out to begin the auction, Gemna and Jayne find her in the back room strangled. The decorative cord used to kill her is missing from the front of the tea shop implying that one of the attendees did the crime. However, a back door to the alley was also unlocked so there was access from outside. Kathy was not well liked by half of the museum’s Board and volunteers leading to plenty of disgruntled suspects. When Gemma is asked to help the hated Maureen to clear her name, she agrees and the game is afoot. I adore this series! Gemma and Jayne are genuine, relatable, and seem like old friends. The mystery is rather difficult to solve, which makes this a great choice for armchair detectives. Gemma’s romance with handsome Detective Ryan is moved forward a bit as is her friendship with Grant. A Scandal in Scarlet has something for all cozy readers. 4 stars! Thanks to Crooked Lane Books and NetGalley for an advance copy in exchange for an honest review.